must have tools for any business. WAKE UP and get one ASAP! Today’s buyers only engage if the website provides compelling experiences, relevant content and a reciprocal relationship. Our team can create a highly effective website aligned with your customer’s and your business goals. All our websites are Mobile & SEO optimized, Social Media & User friendly, responsive and unique in designs. Mobile apps are becoming more dominant in digital space. If you think that mobile apps are for big name brands, you are wrong. More and more small and midsize businesses are following the mobile trend and creating mobile apps for their businesses. 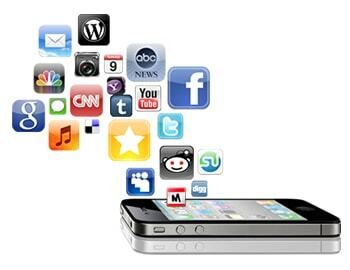 Mobile apps offer several benefits to a business. Mobile apps creates direct marketing channel, builds brand and recognition, improves customer engagement, stands out from the competition and gains customer loyalty. Right On Solutions offers creative and dynamic mobile app development services to mobilize your business and create your mobile entity. Our team is eager to help you reach out to your customers. We offer both Android and iPhone app development for mobile apps.